Spread the cost of your device over 24 months with the TELUS Easy Payment program. Pay upfront with no monthly fee. Smart notifications keep you updated about your car’s health and security. Receive instant notifications about your car’s battery health, error codes and disturbance alerts. Easily install Drive+ by plugging it into your car’s OBD-II port. Once installed, you can connect up to five devices to the Wi-Fi hotspot. Enjoy smart notifications about issues that can affect your vehicle's performance. Get battery alerts, maintenance reminders, fuel efficiency information, and more. Get instantly notified about safety and security threats. Track your car’s status and even receive boundary alerts while driving to stay safe. Enjoy the convenience of a fully connected car. Get vehicle diagnostics, speed alerts and a detailed history of your monthly driving habits to improve the maintenance of your car. 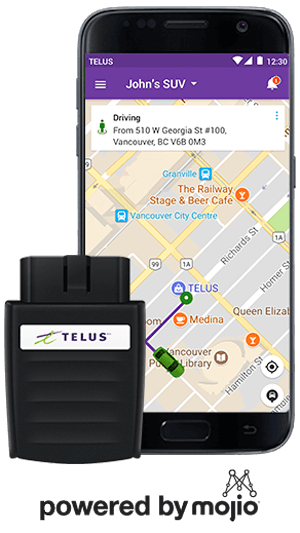 Connect your TELUS Drive+ with a SIM Card for speedy and reliable network. Stay in touch and hear every word clearly with the easy-to-use Jabra Talk. Keep your phone charged and ready for anything in your connected car.